Protecting your financial information is an obligation for every business, whether big or small. It is the duty of the stakeholders in a business to understand the security procedures that are necessary for the cause. Events of identity theft and hacking have increased ten folds over the last six to seven years. Hackers have been able to obtain key information like personal details, email information, and financial information. To make matters worse, people didn’t even know about the theft most of the time. Therefore, it is important to protect all of your key information by following these tips. A weak password offers a hacker a walk in the park. Ensure that you use strong passwords that involve numbers, symbols, and other variable patterns to make your accounts impenetrable. Avoid using standard names of things and places. Do not write down your passwords on digital platforms, instead write them down and store them in a secure place. Alter the passwords regularly if you are keeping critical financial information or something else of importance. And, by no means, should you share your passwords with anyone. Keep them private and secure at all times. Firewall and security software is a must if you engage in frequent financial transactions. 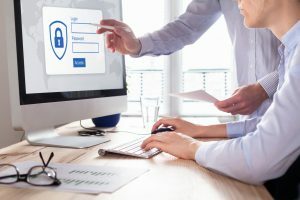 As a business, it must be your utmost priority to install the latest security features because your survival depends on protecting your financial information. Update the software regularly; in fact, use the auto-update feature if available. There are many hardware devices that are available on the market for additional security, however, their use is recommended for highly classified information. It is harder to secure a mobile device than a PC. Therefore, avoid using it for financial matters unless there is no way around it. Most cloud storage services ask their customers to create a two-factor authentication to access their accounts. This provides an added layer of security to your account. Whenever an unknown device attempts to access your account, you will have to approve it via another secured access point, which has been determined beforehand. Two-factor authentication is great for protecting your financial information. The efficiency is also great as you will receive an immediate notification on your cell phone or any other registered device. You will be notified immediately of any suspicious activity. Unsecured WiFi connections are highly vulnerable to malicious attacks. Public WiFi’s are the most susceptible as their security settings are at a minimum level to allow everyone access the internet. This makes these networks a lucrative target for hackers. At times, while traveling, individuals tend to use airport or hotel WiFi services. They should be careful not to send or receive any financial information when using the unsecured network. Update your local network security settings for maximum protection of your financial information. The device that is assigned to secure the financial information should be used carefully when downloading. Often, viruses and bugs come in small patches that are downloaded along with the requested file without you even noticing. Before clicking any download link, ensure that the website is running on a secured (https) platform. Most hacks and losses of data take place because people are careless or uninformed when it comes to downloading. It should be company policy in order to protect your financial information that employees should take extreme care when downloading online material. Emails are another area of vulnerability as they have forged the way for many scams, frauds, and hacks in the past. Any email that seeks personal information should never be responded to. Call the companies on their authentic numbers given on their website if you receive something of the sort. Don’t even open the emails that look suspicious from unknown senders. Protecting your financial information is a top concern for many organizations in this day and age. With all of the uncertainty in the air about data protection and safety because of the incidents involving Facebook and Cambridge Analytica, you must take timely, proactive steps to secure your data and personal information.